Pitkins Dale City Hardware, Inc.
Our family welcomes your family to our locally owned hardware stores with locations serving Woodbridge, Dale City, Lake Ridge, West Ridge, Southbridge, Occoquan, Lorton, Fairfax Station, Montclair, Aquia Harbour, Stafford, Manassas, Wellington, Bristow, Fairfax Station and all of Northern Virginia. Our ACE® locations in Manassas (Woodbine) and Woodbridge (Dale City) are ready to help you with all of your projects. Call us today for details and pricing on any of our home and housewares products. Traeger wood pellet grills pack big hardwood flavor, from sweet cherry, to savory mesquite, into everything you grill, smoke, bake, roast, braise, sear, & BBQ. Traeger's wood pellets are made with 100% pure, natural hardwood giving you authentic flavor and nothing else. Grilling has never been easier - just set it and forget it and let the Traeger work its wood-fired magic. NEWLY REMODELED: Pitkins Woodbine ACE® Hardware Store in Manassas VA is open to serve you. The store is located in the Woodbine Shopping Center right off Bypass 234 Dumfries Road. The hardware store offers a wide variety of products and outstanding service. The store also features Clark Kensington paint, Black&Decker Tools, Craftsman Tools, Dewalt Tools, Scotts Lawn Care, Valspar Paints and Coatings, Yeti Coolers and Drinkware and a large variety of Specialty Products. 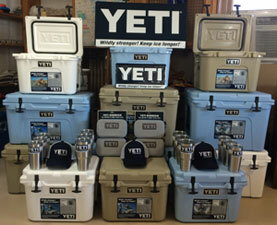 Pitkins Dale City Hardware offers a wide selection of Yeti products. You'll find coolers, hoppers, ramblers and much more. They make fantastic gifts and are the ultimate in design, performance and durability. Come see our selection today! Amy Howard Home grew from leading the interior design market by restoring and building luxury home furnishings, to providing makers with a distinguished class of artisan-quality paint products and training. Pitkin’s ACE® Hardware is proud to carry this exclusive line of paints for all your furniture or home accessory restorations. HAMER'S HOT ONES are now in stock and we deliver pellets to your home. Also stop by and see our new line of TRAEGER Wood-Fired Grills. Please don't forget we also offer tool sharpening, glass cutting, screen repair and delivery service. Check out our Services Page for details. 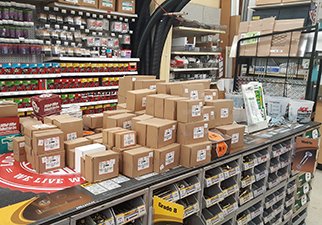 The ACE® Rental Place is located at the Dale City Hardware Location: We provide a rental store within our ACE® Hardware store, to offer the ultimate in customer convenience. Our rental center offers a complete selection of quality rental items that are well maintained with expert customer service. Our rental store offer a wide variety of equipment for rent on an hourly, daily, weekly and even, monthly basis. Please click on our Services Page to observe our complete line of rental tools and equipment. We are a Commonwealth of Virginia minority owned business.